-- Please Select --Size 6 1/2 / 20"Size 6 5/8 / 20 1/2"Size 6 3/4 / 21"Size 6 7/8 / 21 1/2"Size 7 3/4 / 25"Size 7 7/8 / 25 1/2"Size 7 / 22"Size 7 1/8 / 22 1/2"Size 7 1/4 / 23"Size 7 3/8 / 23 1/2"Size 7 1/2 / 24"Size 7 5/8 / 24 1/2"Size 8 / 26"
This customary gold mitre is designed in the auriphrygiata fashion, with plain gold coverings and extended fringe lappets that are traditional enough for Advent, Lent or fast days. Our high-quality, gold silk mitre features the finest silk imaginable over the traditional cap portion as well as on the interior. This mitre is crafted in the standard shape of a mirroring mitre with a united piece of material that allows it to fold. 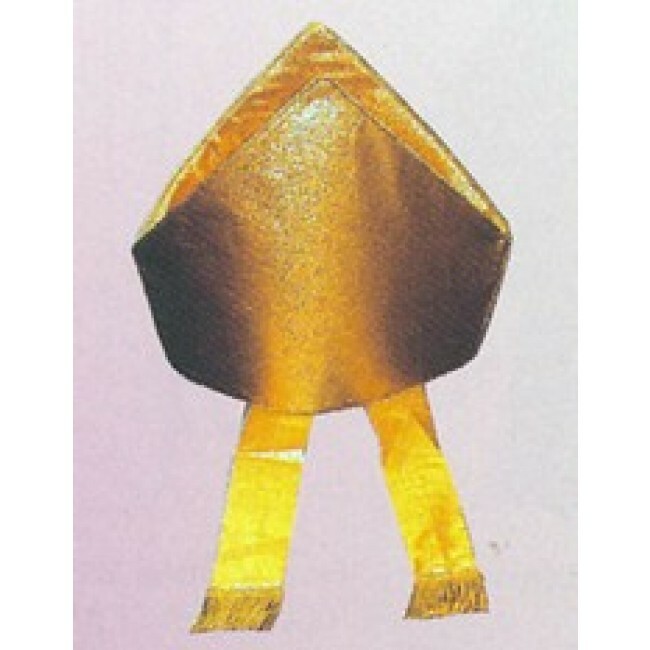 All of our gold silk mitres come in a wide variety of sizes and can be ordered with a personalized, memorial label.